11 Apr “Spring on Prince William” revealed! With a Share-to-win $100 Tuck Gift Certificate contest! With Spring finally here, we have reinvented the store once again! Twice a year we close up shop, put on our work clothes and renovate and redesign the store from top to bottom. 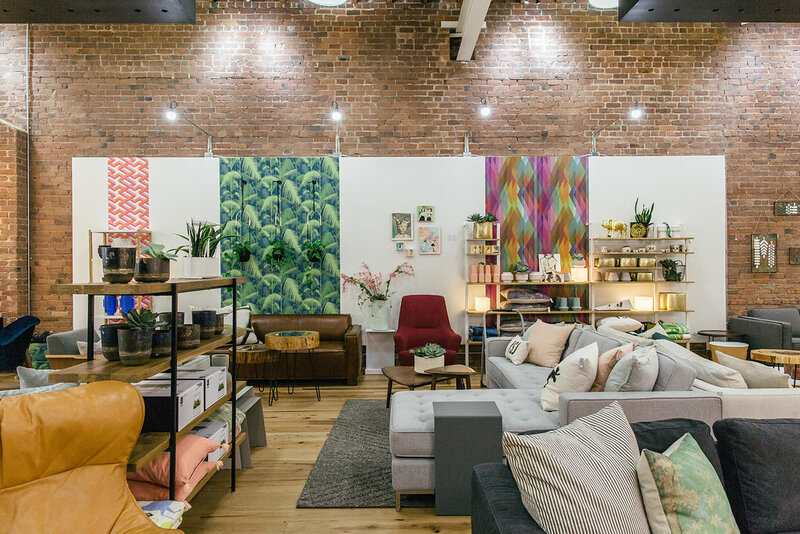 This season we’ve turned the store on its head by switching all our light bulbs to environmentally friendly LED, painting the walls white, adding new wallpapers from Cole & Son, and bringing in new products from our long time partners Gus* Modern, EQ3, Umbra, and more! Before we jump right in to more fun bits, be sure to join in on our contest fun! There are three ways you can share and each share earns you more luck to WIN a $100 GIFT CERTIFICATE TO TUCK STUDIO! Hop over to our instagram account and tag a friend on our timelapse post! Contest ends: April 20th, 2018. Winner will be notified on our instagram, facebook and twitter account. And of course a thank you to the Tuck team; Alex, Craig, Heather, Josh and Judith! We enlisted the services of Matt Fitzpatrick to film 5 days of renovations in the front section of our store and condense it into just than 2 minutes! In addition to Matt’s time lapse, we called on our long time collaborator and photographer extraordinaire, Kelly Lawson to photograph Tuck’s new interiors, furnishings and decor! New Customizable Climb Shelves from EQ3, stunning Cole & Son wallpapers, some of the latest designs from Gus* Modern including the new Hilary Chair in Stockholm Merlot fabric, the Cabot Sofa in Saddle Brown Leather adorn our art wall! Photography by Kelly Lawson, featuring Gus* Modern’s Carmichael Bed in Parliament Stone Fabric, Return Bench in Black Oak, and Belmont End Table in Walnut. After living with the warm incandescent bulbs at Tuck for over 2 years the decision to switch to LED was easy! We enlisted the services of our friends at Duncan’s Electrical to change every bulb in the ceiling, 17 feet high! Photography by Kelly Lawson of the Pink & Brown Cocoon Pendants hanging above our counter. We hung over 400 of Umbra’s new Vine Wall Decor for our window installation! Paired with glass shelves from Metcalf Glass, installed by Christoph from CM Woodcraft, to display EQ3’s Posey Vases, and brand new lighting it’s simply… divine! Thank you especially to Alex, Craig, Judith for hanging the lights and all those vines! And, we are always in awe of Joshua’s ability to ‘dress a window’. Photography by Kelly Lawson featuring SLAB Dining table, EQ3 Nixon Chairs, the Gus* Modern Atwood Sofa, the Gus* Modern Mix Armless Chair, ceramics by Darren Emenau, Lori Harrison Cushions, the Trica Tam Tam Coffee Table, and artwork by Ryan Livingstone. Our upper level Kitchen & Bathroom section got a bit of a facelift with new candles and soaps from Dot & Lil, and new products from Umbra, Umbra Shift, EQ3, and Chilewich! We’re proud to offer a variety of tile options from Ceragres as well as our very own line of Window Coverings!